This line comes from Red Bull, where Linendoll started her career in marketing and sales. Going around the country meeting lots of different people, her mission was to educate people on the drink, at a moment when no-one knew it. The key for her was “creating rapport”. If you want to connect to people, you need to “read the room” and adapt to people. If they say “awesome”, you say “awesome”. In short, like Covey told us with habit 5: “Seek first to understand, then to be understood”. If you want to be an expert in your space, you need to be able to walk-the-talk. This is not just about gathering and understanding the content, but about truly understanding the reality and the issues of the learners you are working with. Comparing this to Robert Todd and Laura McBride’s session on the context conundrum, I was slightly critical of this point. I agree that we need to know what we are talking about. But in 2014, I think learning professionals have so many opportunities to not do this work themselves. The real experts are the learners themselves and the experts in the organisation. Surely they are better placed to bring that context to the learning initiative, or create and deliver content? Working for a shopping channel, Linendoll’s job was to get her message across in anything from 30 seconds to 1 hour. Feedback was immediate: If she couldn’t make it clear, there were no sales. Work on your marketing and presentation skills. Even if you are a designer not delivering training yourself, the ability to make your point is key. See also Connie Malamed’s work on how to really make your point with visuals. …clearly the running theme of a conference called “TechKnowlege”, but still worth reinforcing one more time. The technology is there. Use it! Too often in the learning world, we try to create clever things from scratch to achieve important goals. Linendoll reference the challenge of delivering books to Africa to help build literacy. Where some villages don’t even have good roads to get in there,, how are you going to deliver piles and piles of books? The answer: Don’t! People want to be entertained. Throw out your materials and forget the PowerPoint, says Linendoll. Bring some fun to learning and be authentic. Some people won’t dig it, but most will appreciate having an authentic real human in front of them. …thanks for reading. Catch you at ATD ICE in May! Scope: Big company, diverse functions, lots of data, regulatory + compliance needs, large geography, reduction in budget and a need for quality training. ATD TK 2015 speakers: Kimberly Green and Erika Steponik of Blue Shield California. Build something in-depth to deliver in a classroom and invite everyone there for a day. According to the speakers, these modules have multiple benefits: They are repeatable, scalable, flexible and much more economical. 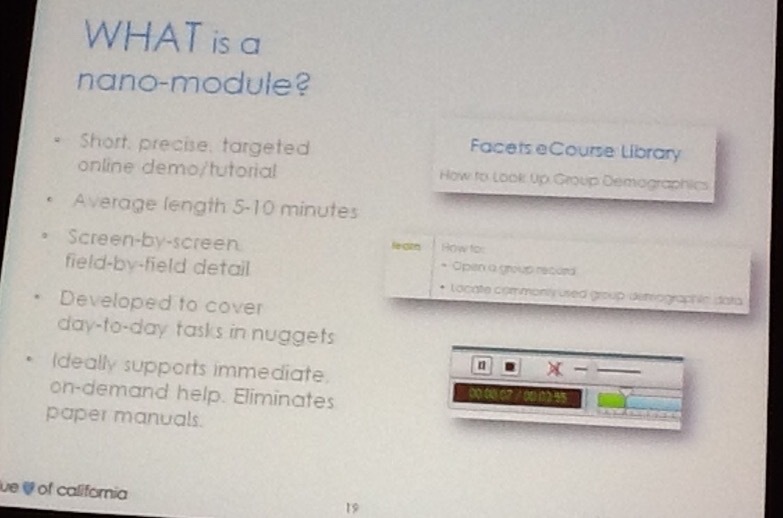 To make it work, we were told to standardise the look and feel of the modules and catalogue them well. This leads to a good, secure and trustworthy feel for the users. In addition, it is important to have an intuitive centralised system that reduces barriers to access and learning. In short, once again, form sells function. If I understood what Blue Shield is delivering to their learners, we are however only talking about giving pockets of knowledge. I say “only” because I am not convinced that delivering knowledge = learning. But that doesn’t make the session irrelevant. In Belgium, one of the organisations I work for is working hard to create a truly flipped-classroom experience. The concept is simple: Put the knowledge-acquiring part of learning out of the classroom so that training time is us to better effect. It works much better than before. If we could further reduce and compartmentalise that knowledge-acquiring in the way Blue Shield have done, maybe we could make it even better. Last year, I took 200 dollars to the casino. I wanted to experience the casino (for the first time) but not get too sucked in. It lasted 43 minutes. I am the worst black-jack player ever. This year, I will follow a session with Michele Lentz from Oracle on bringing the magic of Jim Henson to instructional design. And apparently a real Muppet will be present. That’s got to be worth an interview, right? It’s sad, but true: I get-off on positive auditive feedback. My wife will tell you that even if she sarcastically says “I love you” during an argument, I still take it positively. During my previous conference sessions I have convinced participants to make enough noise that JD_Dillon thought there was a train coming through . Can this be beaten? You may not know that I am apparently a US-drug-dealer magnet. I don’t know how it happens, but Denver, Dallas, Washington, Vegas, wherever… someone always tries to sell me something horrible. Credit to the last guy, who rather than outright asking “Do you need any crack, brother?” actually chatted me up for a while first with talk about the album he needed money to produce… I made it to my hotel… so far so good. ..and speaking of the hotel, I definitely owe fellow-speak Bianca Woods a beer. I was booked at Caesar’s Palace for over $200 a night, but she told me about the Flamingo just across the street. I have already saved $150 a night on the room. Which, by the way, is still awesome! Thanks Bianca! Tune in for updates throughout the week. Katie started by telling her own rags to riches story * When listening, I was drawn to hear more and I started to like her more. (My neighbour said it didn’t really do anything for her). Stroud said that story activates the brain. It touches the senses and emotions. Because more of the brain is activated, it is more likely to be remembers and integrated. * There are many other types of story (boy meets girls, Hero’s Journey …) which we are not necessarily going to see here. Background – my story is about an IT consultancy company. People have strong technical skills, but they aren’t capturing new opportunities that arise for time-to-time. Setting – in my world, the employees of this company are distant from their own company colleagues. They work on client-sites. The client’s building is very quiet, badly lit and “dry”. The workers on the client site don’t really talk to each other much. Conflict (the problem that stops us from success) – there is no time to talk, our hero is nervous and introverted. He doesn’t feel connected to or supported by his company while he is at his client-site. He doesn’t really feel like he can “win” or grow. He is unsure about how to proceed. Place it – where does the problem happen? My hero is at his desk, “hiding behind his computer”. Define it – what exactly is the problem. My guy gets a question from someone (his client) that he wasn’t expecting. It’s not part of his job and he feels uncomfortable dealing with it. Given his slightly introverted nature, it feels like unwelcome noise in his ears. “Please leave me alone to work”, he thinks. Scope it – what is the extent of this problem? For my guy, it’s not the first time he has felt like this. In fact, it happens in other social scenarios too. When he is with his few own good friends, everything is fine (albeit a bit geeky!). But when he has to talk to strangers (or a girl!) he doesn’t really know what to say. Solve it – define how it would be if everything was fine. My hero would breathe gently, relax, smile and look up (come out) from his computer to give his full attention to the client get to know what’s going on and then be able to confidently send an email to his business development manager detailing the situation, values and needs of the client. Hero – the person in the story that is going through the problem and will come out differently at the end. He may also save a victim. My guy is Paul. He is an IT developer. He is usually quite quiet and tends to feel most comfortable with people he knows, talking about things he understands well. He has been working for 5 years since school and doesn’t feel like a “high-potential”. Victim – the one who is really “dying” in the situation. He needs help. He may even be attacked by a villain. I thought about a “rubbish guy who has no friends”. He always eats alone. He will never grow in his function. Our hero doesn’t want to end up like him in 5 more years. Supporting characters – the other people in the environment that have some kind of impact in the story (or competence problem/solution). I have the onsite client who is a normal business man who just wants good solutions. Friendly, to the normal extent. We have the client receptionist who is a nice young lady who has all the kinds of skills that our her ones, but doesn’t need them in her work. And we have an extrovert sales-guy from our hero’s firm, who is pushing (in a nice way) for more leads. Villain – the person (or “thing”) who has the behaviours that are going no to hinder the hero in his quest for success. In my story, this is the IT developer from a competing company. He’s not a bad guy at all, but if our hero doesn’t achieve his goal, this guy will. Katie proposes that you don’t use real people from your business in the story, but focus on character types, personalities, (in)competence etc.. There are some classic personality types you can bear in mind: Dominating people, passive people, manipulators… She also noted that you don’t need to literally translate the story. In my case, I could have taken the story entirely out of the IT world and just used a “boy meets girl, but can’t get to know her” story as an analogy. Given the wish to integrate this story into a training with an existing client in the IT sector, I preferred to “keep it real”. With the background in mind, each story has to have 4 phases: Setting, conflict, climax and resolution. But they don’t have to be presented in that order, or in the same way. There are 4 models ways to proceed. The first model under consideration is used for introducing something new in your training, like a skill or attitude. Here you need to focus on the climax phase at the beginning of the story. You talk about the moment when the problem is being solved. This will help to introduce the behaviours and attitude required to achieve success. Of course, in this story model, we may go back in time to the status-quo as the story/training evolves. For technical skills training, you need to put a lot of time into characters early. This will create more empathy from the learners. How you proceed through the story phases noted above is flexible from there on. If you are trying to get better adoption of something new (process, solution, tools) where there is resistance, you need to focus on the resolution phase first. This will help to build the feeling of potential benefits (of the new thing) for the learner and build an image of a better world when the change is completed. Yo ur can compare this to the visualisation exercise seen in Juanita Coble’s session. If your issue is creating memory, you need to focus first more on the territory of the story (background and setting), using good memory-enhancing skills. If you can do this in a visual way like Hans Rosling does, you’ll definitely achieve this! Can everyone create a good story? Having gone through the exercises in the session, I have the feeling that there may be one major barrier for instructional designers and trainers to actually get started with this. Personally, I am loving it and finding it very easy. I like new ideas, I find it easy to think of analogies, be a little out of the box and go through the steps. But not everyone can do this, or like it. * During the session, many participants were asking closed (yes/no) questions to the speaker. For example: “Could the villain be “time” rather than a person?” The fact that they didn’t just say “I think the villain could be time, rather than a person” seemed implied to me that people were feeling uncertain about their ideas, needing reassurance. * Interestingly, whilst taking us throughout the steps, Katie used story to introduce us to a friend of hers (Eric) who hates to learn new things and finds it difficult to do what she asks. He suffers, he pulls his hair out and doesn’t know what to do. Very clever meta-approach to her session! OK, so where exactly is THE story? …and if you do the things and do them well, you will have a thin-red-story-based-line which learning participants can relate to, may feel emotional about, are more likely to remember and more likely to learn from. Davis is interested in why many one-shot training sessions don’t stick and don’t make the change they were designed to achieve. Asking the audience, we can see that almost everyone finds that people learn at their training events, but then never use what they learn and end up forgetting it. Why is this? The NeuroLeadership Institute has been trying to find out why. At the root of the problem is the hippocampus, which deals with attention, generating links, emotions and spacing. 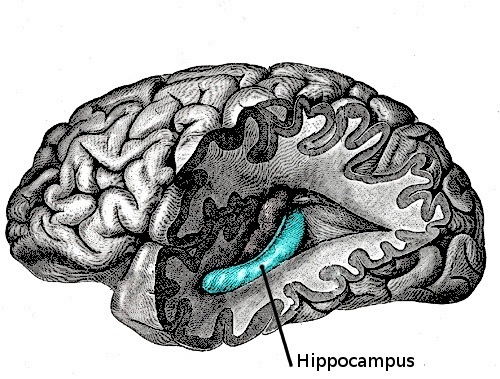 Due to its central position is the brain, the hippocampus is responsible for coordinating the neural connections required to create memory and habit. To create a rich web of connections in the brain, you need to engage the hippocampus. Davis starts by telling us about attention. Attention is not designed to last. It is designed to keep looking around and being aware of what’s going on. If you don’t, you die. Simple. Attention can last about 20 minutes. And of course, in the training game, we tend to work a lot more than that! But in today’s learning environment, we must be aware that we are fighting more-and-more for attention from participants. According to one study, today’s multi-tasking high-media users have significantly diminished capacity for attention. Even when asked to remember something for just 1 minute, they do a lot worse than their non-connected single-focused colleagues. But it’s worse than that: Their multi-tasking tweeting, iPhoning activities is making it harder for the others to pay attention. What’s the point? Single focus of attention is required to tell the hippocampus that what we are looking at is something to recall. Divided attention doesn’t do that. Don’t forget, the hippocampus is trying to make links in the brain. It tells puts together everything that is going on about feelings, visual stimuli, thoughts, previous knowledge and memories etc.. As learning professionals, we need to help it. Metacognition (or thinking about thinking) is a great approach. Self-reflection on the learning process generates more connections, which will make the content more easy to recall. For example if we were trying to remember a specific word, we could think about how it looks on the paper, or how it sounds in our ears when we speak it out loud. We try to get the brain more aware of what is going on while it processes the information. Retrieval strategies are all about practising recall of what is being processed. If you don’t test retrieval, your chances are significantly lower of remembering than if you practised remembering several times. Insight activities or moments help to promote memory of content. If you can create real “ah-ha” moments, where people finally “get-it” your participants will be more likely to remember. Davis says that this is because the “ah-ha” insight moment adds a level of emotion to the experience. Davis offers some simple strategies you can use in training: Polling, guided reflection on personal experiences, note-making, explaining ideas to others (and creating tweetable messages or mini-presentations) and hearing ideas from others. …OK, not really. But kind of! Davis explains that because of the proximity of the amygdala to the hippocampus, if we can create emotion in learning, there is more chance to build attention and lasting memory. As we are more emotionally aroused, the amount of catecholamines released into the brain by the amygdala changes. Davis says that we need to find the sweet spot of optimal-arousal that improves attention, but not so much that things get scary. If you come back to them later (repetition) with questions and reinforcement of content, they are more likely to remember. If you can change the context of what is being learnt (or even where it is being learnt), this is also more likely to make sticky learning. I had contacted Josh Davis prior to the session to ask him if the session was going to be very “deep” and heavy on facts, figures, statistics and studies (all of which I am allergic to in conferences). He told me that the session was scoped for starters, people with not much knowledge about NeuroScience. I am pleased to report that that was the case and as a very positive outcome, I have learnt something: If you want to make learning stick, you need 4 strategies to engage the hippocampus. Rueben Tozman said we must start by thinking about business in the same terms as our customers … and then define data models that tie behaviour, processes and learning activities to bottom line results. Based on those models, we can create data-driven-learning initiatives that can truly assess the situation and improve it. 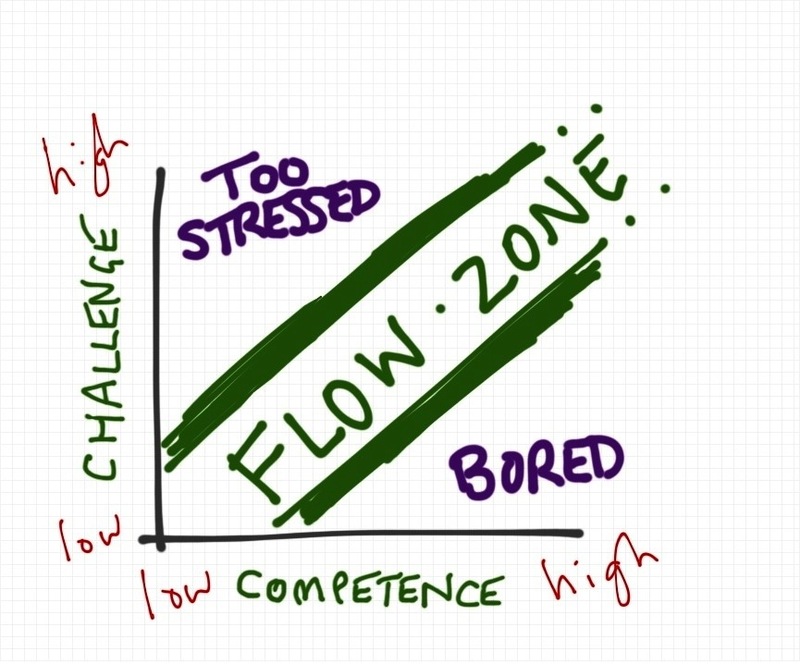 Too much of what we do in L+D (particularly training) is either unmeasurable or unmeasured. At the best, we can only say how people reacted to a training, but we cannot say that performance issue “X” is due to reasons “A”, “B” or “C” or that “A”, “B” or “C” can be resolved by specific (and effectively measured) learning initiatives “1”, “2” or “3”. While the rest of the business reports on almost everything, learning stumbles along on hope and faith. To help us out, things are changing in the world of learning measurements. The traditional LMS and its “who followed what training” statistics will be replaced with advanced learning record systems, using experiential APIs like Tin Can, that could link pretty much any learning or performance activity to a data model that provides real insight to the learning profession. And so my first conclusion is as follows: Know what makes the business run, be open to something new and be able to design data-driven learning experiments to assess effectiveness and really improve performance. Technology conferences tend to focus on new approaches to learning; TK14 was no exception. Starting with quite basic “enhancement strategies and tools” like QR codes for training, video learning initiatives and social media for formal learning and moving past transmedia storytelling to more granular MOOC-based learning strategies or attempts to gamify the learning experience, the thin red line of it all was “engagement”. Amy Jo Martin kicked-off TK14 day 2 with a message about engagement and sentiment: “What connects people to you is not what you do, but why you do it”. * Extrapolating, I thought about why learners engage with other learners, materials or specific formal initiatives: They do it because they want to improve, to find solutions, to get good at something and because they “dig” it. In all our efforts to support this, we need to keep that basic engagement alive. * This week, the London Learning Technologies Conference was opened by Brian Solis, known for his message about “the secret ingredient to engagement: empathy” and the importance of the user-experience. Jane Bozarth and Mark Oehlert said that learning communities exist everywhere and our job is not to convince people of their value, but rather to convince them to see the value of “formalising” community activities at work using specific platforms (like Yammer or LinkedIn) and more open sharing or learning narration. If we start small, think big and move fast (Oehlert – video) with community activities, we can create a river of information flow that has real value for the organisation. What really stood out for me (and kept me awake at night!) was the unique and numerous possibilities of mobile, as outlined by Chad Udell. Coming to Vegas as a mobile learning cynic, I was thinking only of more boring e-learning delivered on small screens. Leaving, I am convinced that since more-and-more people love to play with their phones and phones can do more-and-more things, there are real opportunities to engage and create learning effectiveness. Bring on the mobile revolution! Either way, my second conclusion is simple? Let’s find better ways to make the learning experience awesome, natural and effective. Experimenting and engaging – that is the message for me from ASTD TK14. Dr Kella Price is giving us the low-down on the added-value of QR codes in learning. As an experienced user of many-things internet, I’m looking forward to seeing what’s new and how to get the best out of the QR principle. Everyone in the room has at least scanned a QR before, so we are all ready to learn more…. A QR code is basically a link. You’ve surely seen one before somewhere. They look like this. At my children’s school, all the kids have QRs on a keyring attached to their bags for 2 reasons: In the case of an emergency, it is linked to contact details of their parents; when they stay at the crèche late at school, it is used to automatically create invoices for the service, based on the check-in/check-out time. Why use these QR codes at work? What is the real value? Where should I put them? The first thing to know is that people do scan these codes. In 2013, 181 QR codes were scanned every minute. Training participants today have mobile devices and they like to use them. Letting them use their devices in a training environment should therefore be…. (wait for it) …. engaging. And the application possibilities are enormous. You can give them resources and information and create real-time interactivity. According to Dr Price, the biggest value in any activity we do with these codes is the conversion rate of request/action. For example, if you send an email to people asking them to do something like enroll for a training or take a survey (request) you might get a conversion rate (action) of “X”. Price says that if you to integrate QR codes in other media you will get more than “X”. What kind of media actions are we talking about? Where can we add QR codes? What kind of actions can these QR codes produce? Here, Dr Price is quite clear: The possibilities are endless. If you have an internet resource to share, put it in a code. …what ideas can you think of to bring value to your training? Where can I make a QR code? Can you do something special with your code? There are lots of free QR code-creation sites online. Some are better than others because they create good value images or can be customized. Use colours for meaning. For example, if you split training content into 4 sections, use a distinct colour per QR codes found in each section. In 2016, I will speaking 3 times at the ATD 2016 International Conference and Exposition in Denver. ..and on Sunday, a short speech during session S4CE Community Express, Learning Technologies Fast Track. Generic references, including books, videos etc..
“How to Really Use Linked-In” – get your free copy here! ps – I reported on almost all the sessions I followed at previous A(S)TD ICE and TK conferences – if you want to read them, follow this link:ATD TAG.